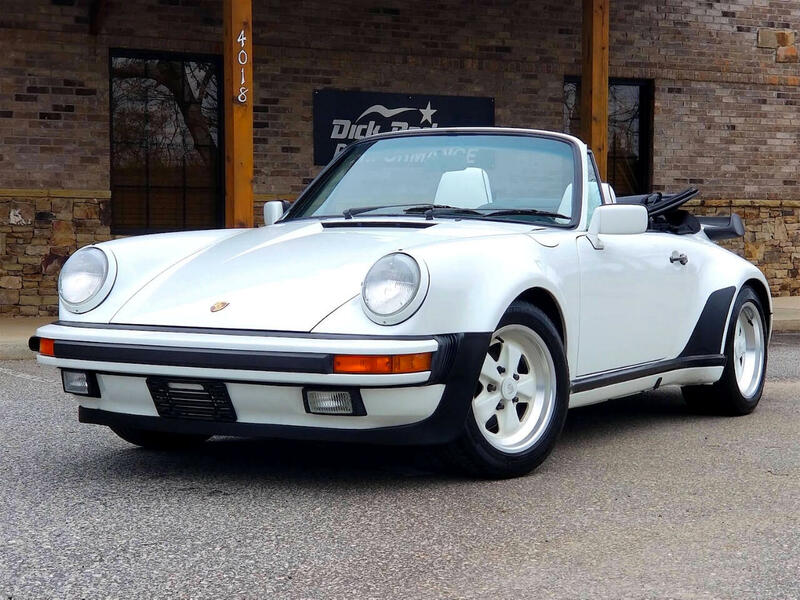 1988 Porsche 911 Carrera Cabriolet G50 Turbo Look. Turbo Look M491 Option (Very rare!). This absolutely gorgeous “triple white” factory wide bodied Cabriolet is quite a rare breed. According to the Turbo Look Registry, only 171 Cabs with the M491 option were imported to the United States in 1988. The M491 option indicates the "Turbo" body without the turbo engine, making it an absolutely balanced performer with its light weight and wider tires, an enthusiasts dream! Adding to its rarity, this particular example comes in a very unique white on white combination, which is very hard to find. Both in and out, the condition of this 911 is remarkable! The Grand Prix White paint glistens and is in 100% outstanding shape. The White Leather Interior is in excellent condition with no cracks or gashes anywhere. Performance wise, this Porsche feels as new and the very desirable G50 transmission truly highlights this car’s shifting action! There is a nice stack of service records, dating back to 2002. In that particular year, the car registered a new owner from New Mexico, who spared no expanse and in the span of next 4 years spent little over $28,000 to mechanically bring this Porsche to its outstanding shape. The 4 year span of this maintenance was between 87K miles to 107K miles. The highlights of these services consisted of a top end rebuild, transmission rebuild, new clutch, complete brake work, and new fuel lines. In November of 2018, the car received a comprehensive service to the cost of $3,500, which included a valve adjustment, new plugs, a brake flush, a new shift rod ball cup and shift rod bushing, re-surfaced flywheel and a complete oil/filter service. Because of this cars rareness and notoriety, it will really stand out at Porsche Club events, Cars and Coffee and in general, everywhere! The upside investment potential is incredible, making it a car you can drive and enjoy! Message: Thought you might be interested in this 1988 Porsche 911.